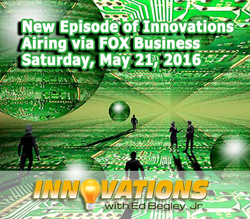 DMG Productions announced today the upcoming airing of Innovations with Ed Begley, Jr., scheduled to broadcast on Saturday, May 21, 2016 at 4:00pET via Fox Business. First, Innovations will explore Aphria, Inc. Viewers will learn about Aphria’s medical cannabis, and how by controlling all the critical factors involved, Aphria is able to provide a safe and effective medicine. The show will then focus on Avid Growing Systems; manufacturers of large scale, turnkey vertical marijuana growing systems. Audiences will see how Avid combins the skills of experienced, proven growers with a dedicated engineering team of HVAC, lighting, irrigation and computer specialists to create a reliable and functional growing solution. Next, Innovations travels to Denver, Colorado to educate about Incredibles, by Medically Correct. Incredibles are edible products made from the highest quality, in house extractions. Incredibles are cut within precise weight tolerances, ensuring consistent medicinal effects every time for Medical Marijuana Patients. This is one of the reasons why Incredibles have become the favorite edible of medical patients. Finally, viewers will learn about Wilderness Calls, and its new concept that mixes hunting and fishing with the conservation of nature. For more information visit: http://www.InnovationsTelevision.com or contact Robert Sikich at: (866) 496-4065 x 805 or via email at: Robert(at)innovationstelevision(dot)com.